A lovely drawing of a couple sitting on a bench in their garden. 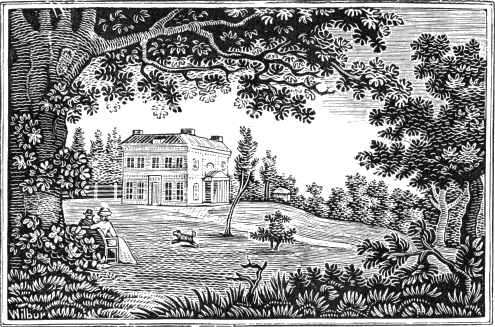 This pretty black and white drawing of a country home and it’s formal lawn has a somewhat mysterious history. The book in which it was found, Alonzo and Melissa, The Unfeeling Father had a number of authorized and unauthorized editions throughout the 1800s. The folks at Gutenberg.org did a great deal of research and believe this illustration is from the 1864 Philadephia release of this story which was a reprint of the 1851 edition. However, they do state that this illustration may date as far back as 1836. There is clearly a signature in the piece – WILBUR. I’ve included this image based on the dates involved and am fairly certain that the illustration was either commissioned by the publisher (where the 120 post publication rule would put it in the public domain) or that Wilbur died prior to 1939 which would also put it into the public domain. If someone knows more about the illustrator, please let us know so that we can correct our attribution.